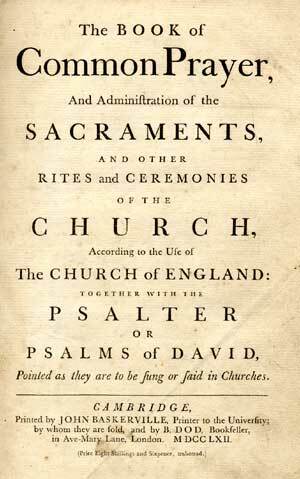 The 1662 Book of Common Prayer (still the official Prayer Book of the Church of England) has gone through literally hundreds of printings. Of these many printings, only a few stand out, chief among which are a series done by John Baskerville between 1760 and 1762. Baskerville was one of the giants of English typography, making a number of innovations, including the Baskerville typeface still in use today. His typefaces were finely constructed, his designs simple, and spare, and made great use of white space. He also pioneered in developing fine papers for printing. His printings of the Book of Common Prayer, done as printer at Cambridge University, came in three basic flavors: single column, two column, and with or without lozenge border decorations. The edition used here is single column, undecorated, and was printed in 1762. It appears in David Griffiths' Bibliography of the Book of Common Prayer as 1762/4; and is #19 in Phillip Gaskell's bibliography of Baskerville's works; the title page may be seen at right. This printing is also available from Google Books as PDF graphics. Another printing from 1760 (single column, decorated borders, Griffths 1760/4, Gaskell 12) is available from the Internet Atrchive. The files below are all in PDF format; if clicking on one of the files doesn't automatically bring up the Adobe Acrobat Reader, you will need to get a copy (it's free) from Adobe. The font used is John Baskerville, from Storm Foundries, which is very close to the original and includes all the characters used in this book. The original pages are slightly larger than half of an 8½ x 11" piece of paper, so all dimensions of the original were reduced by about 8% to fit (e. g., the typeface is 13 point, rather than the original 14 point). The files below are also available as a single PDF file (size = 2.2MB). C O N T E N T S.
Concerning the Service of the Church. Concerning Ceremonies, why some be abolished, and some remain. The Order how the Psalter is appointed to be read. The Order how the rest of the holy Scripture is appointed to be read. A Table of Proper Lessons and Psalms. The Calendar, with the Table of Lessons. Tables and Rules for the Feasts and Fasts through the whole Year. The Order for Morning Prayer. The Order for Evening Prayer. The Creed of St. Athanasius. Prayers and Thanksgivings upon several occasions. Collects, Epistles, and Gospels, to be used at holy Communion. Baptism of those of Riper Years. The Visitation of the Sick. The Communion of the Sick. The Burial of the Dead. The Thanksgiving of Women after Child-bearing. Forms of Prayer to be used at Sea.